Wet Chemical extinguishers are the best restaurant kitchen appliance hand portable fire extinguishers you can purchase. Both have been tested and approved for the new Class K listing by UL specifically for restaurant kitchen hazards. They contain a special potassium acetate based, low PH agent developed for use in pre-engineered restaurant kitchen systems. The recent trend to more efficient cooking appliances and use of unsaturated cooking oils dictates the use of a hand portable fire extinguisher with greater fire fighting capacity and cooling effect to combat these very hot and difficult fires. Available in 2 sizes – 6 liter or 2 1/2 gal. with attractive stainless steel cylinders and easy to use hose and spray applicator nozzle. The superior fire fighting capability of the Wet Chemical agent is placed exactly where you aim it with no chemical residue to clean up. 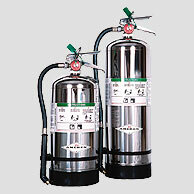 Models B260 & B262 are the ideal “kitchen use” fire extinguishers. They supplement existing cooking equipment automatic system protection for an extra margin of safety.